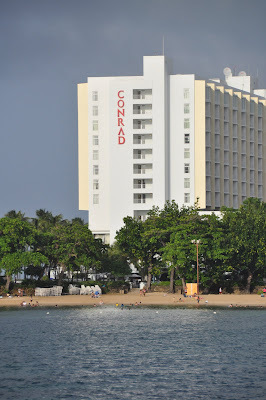 On my recent trip to Puerto Rico, I decided to stay at the Conrad San Juan Condado Plaza (A Hilton property) in the Condado area. I had stayed at this hotel many, many years ago when it was under different ownership and was called the Condado Plaza Hotel. Back then, it was more of a casino-with rooms hotel, and I wanted to see what it was like now. 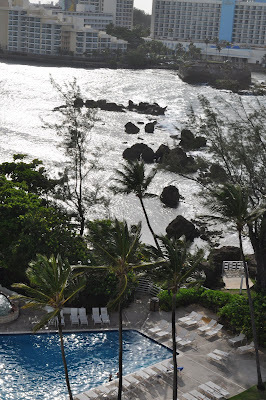 From what I had read and heard, it was supposed to be just like the La Concha Resort (where I stayed the last time I jet setted to Puerto Rico), and so I had to find out if that was true before I recommend it to you jet setters. I have to say, my first impression from the outside wasn't the greatest; it looks like any standard hotel, nothing special. The other thing I didn't like was that there is virtually no beach! What the hotel boasts as a beachfront property is actually a hotel located next to a small beach which is right off of the highway. It is also more like a lagoon than an actual beach...not what you want when you are jet setting to a Caribbean island for a beach vacation. There are two pools (one saltwater and the other with a swim-up bar and a fun slide) - I couldn't help but think this was done to perhaps make up for what lacks at the beach...but it does not!!! 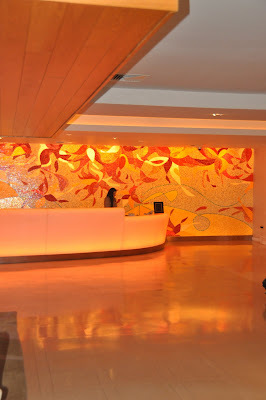 I have to say, however, my impression somewhat changed when I walked into the lobby. 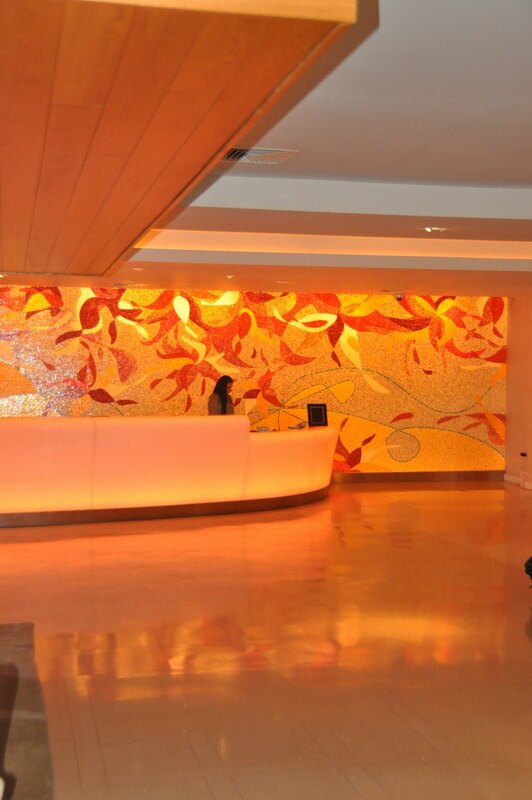 It was bright, clean, and modernized- thanks to a $70 million dollar renovation that was completed in 2008. 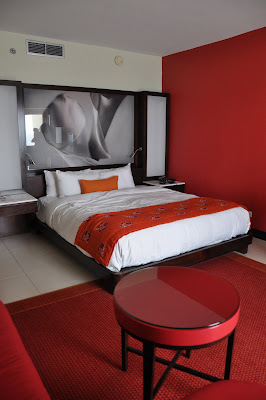 The rooms are nice as well- done in various shades of deep red if you are staying in the ocean tower (where I stayed), and acid green in the lagoon tower. They are spacious, clean, and the beds are comfortable. The hotel does have a couple of decent dining options: Pikayo- upscale Puerto Rican cuisine and Varita- a fun, casual spin on Puerto Rican barbecue. 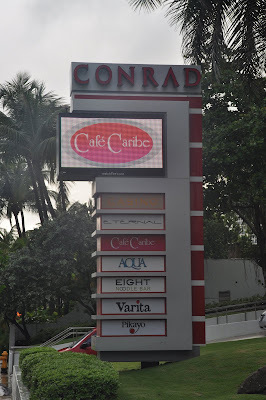 I did not try these restaurants this time, but have them on my list of places to checkout next time. Bottom line, I wasn't so impressed with the Conrad San Juan Condado Plaza, and would not recommend it to my clients. Yes, it's less expensive than La Concha, but I now know why. You may have to shell out a bit more, but at least you will be happy, and that is the Jet Set Smart way to travel! Pros: Renovated in 2008, nice rooms, and the location (about 15 minutes from Old San Juan), means plenty of options for dining, sightseeing, activities and shopping. Cons: Non-existent beach and not great pool scene, non-existent night life, extra taxes that are charged when you check out! No other Hilton property in Puerto Rico charges these taxes! BEWARE!! !